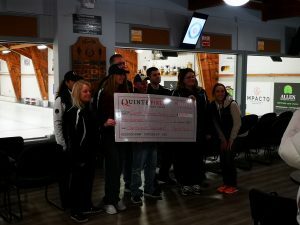 BELLEVILLE – The Quinte Curling Club’s annual Curl 4 Kids has raised over $10,000 for children’s charities in Ontario. During the event, last Saturday, a representative from Camp Trillium was presented with a cheque for $10,000. The funds are going to support a children’s camp for those battling cancer. One of the other charities that benefit from funds raised include Field of Ability, which is building an accessible baseball diamond. Another is Quinte SailAbility, which is a sailing school for the disabled. The event took place at the Quinte Curling Club on Bridge Street. 12 teams of experienced and amateur players were sponsored for a minimum of $200 a team to play a single game of curling.